Recently, Jody Schwan met with Kurt and Valerie Loudenback of Grand Prairie Foods to learn more about the business and its continued growth and expansion. Grand Prairie Foods is part of the McGowan Capital Group investment portfolio. 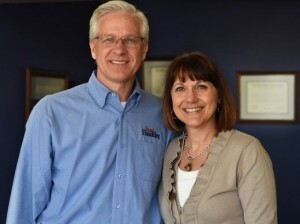 Following is the article that she wrote for the Sioux Falls Business Journal. To view the original article with its accompanying photographs, go to Grand Prairie Foods Expansion. Kurt Loudenback describes it as “one of those moments of fate”. He was in his yard more than a decade ago and stopped his neighbor, who works in the hospitality industy. “I said ‘Hey, send me the email addresses for Marriott and Hilton. I think I have products they would be interested in,'” said Loudenback, a former Fortune 500 executive who had bought Dakota Foods in 2003 and renamed it Grand Prairie Foods. Now, Loudenback and his wife, Valerie, lead a company with about 150 employees that is about to add 50 more and double the size of its main facility at 1400 N. Cleveland Avenue by the end of the year. The company provides food products to hotels, hospitals and nursing homes nationwide and does a significant amount of private labeling for major brands such as Bob Evans, Hormel and Johnsonville that seek out Grand Prairie for its ability to combine a meat product with a dough product. Eggs are about half the business. Grand Prairie moves ten million pounds of eggs annually through its facility in the industrial area near the Sioux Falls Regional Airport, including its own scrambled egg product that supplies breakfast for every Hampton Inn. While much of the industry got hit by the avian flu crisis last year, Grand Prairie’s supply was diversified enough that it could bring in eggs from farms that went unscathed. Because the company could maintain its supply chain, it picked up all the pre-cooked egg business for the Holiday Inn Express chain. 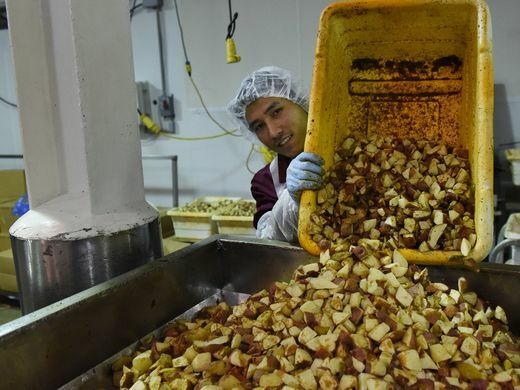 Ajong Beny pours breakfast potatoes into a machine to be packaged at Grand Prairie Foods. Earlier this year, Grand Prairie expanded in a different direction, building and opening a gluten-free bakery across Cleveland Avenue from its headquarters. The company has started producing gluten-free muffins, cookies, bagels, hamburger and hotdog buns. A big customer is driving expansion at the main facility. After 18 months in development to produce a meat and dough-based snack food for a large brand, the client decided on a full national launch instead of a phased approach based on positive feedback in product tests. “So we just say yes and we have to move quickly,” Valerie Loudenback said. Construction will start soon to add 20,000 square feet, and the company needs to hire 50 people, mostly positions on the production line with some new supervisors. Grand Prairie was named employer of the year earlier this month by the Lutheran Social Services Center for New Americans for its commitment to supporting workers of all cultures. The company goes “above and beyond by not only offering employment opportunities to newly arriving refugees, but Grand Prairie strives to make its new employees…feel welcome,” said Tim Jurgens, the center’s director, adding the company “remains flexible and adaptive to all skill sets.” A large portion of the workforce comes from other countries. Grand Prairie offers paid time for literacy classes and works with LSS in recruitment. Leyla Kadirova places labels on a frozen food item while working at Grand Prairie Foods. “Many are extremely intelligent people but may not have the best language skills to be successful,” Kurt Loundenback said. “But they work well within our organization because they’re put with peers who share common language capabilities and some also have very good English-speaking skills.” The company “encourages people to learn and better themselves,” Valerie Loudenback said.